Our current interest is in the development of tools for fluid-structure interaction problems. Such problems are abound in diverse fields such as, blast loading of structures,Flow induced vibration of structures, sloshing dynamics of liquids, mixing and separation of macromolecules, FSI problems in human circulatory systems etc. The focus is on the method development and specific to an application. The algorithms cover continum based models involving mesh based techniques as well as meshfree simulations. IIT Madras, Chennai - 600036. 1. A. K. Chauhan, B.V.S.S.S. Prasad and B S V Patnaik, Heat Transfer From Annuli of Large Radius Ratios and Eccentricities, International Journal for Numerical Methods in Heat and Fluid Flow, 24, 1864 - 1887 (2014). 2. R S Kumar, B S V Patnaik and S Vedantam, Transport of DNA in hydrophobic micro channels: A dissipative particle dynamics simulation, Soft Matter, 10, 4184 - 4191 (2014). 3. S. Mathew, B S V Patnaik and T J Tharakan, Numerical study of air-core vortex dynamics during liquid draining from cylindrical tanks, Fluid Dynamics Research, vol. 46,1-18 (2014). 4. M A Dhanwani, A Sarkar and B S V Patnaik, Lumped parameter models of vortex-induced vibration with application to design of aquatic energy harvester Journal of Fluids and Structures, 43, 302-324 (2013). 5. A S Pai, P Prakash and B S V Patnaik, Numerical Simulation of chaotic mixing in a lid driven cavity : the effect of passive plug, Engineering Applications of Computational Fluid Mechanics, 7 (3), 406 - 418 (2013). 6. 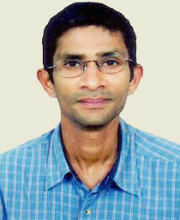 A. K. Chauhan, B.V.S.S.S. Prasad and B S V Patnaik, Thermal-hydraulics of rod-bundles : The effect of eccentricity, Nuclear Engineering and Design,263, 218-240 (2013). 7. R S Kumar, B S V Patnaik and S Vedantam, Hydrodynamics of the Developing Region in Hydrophobic Microchannels: A Dissipative Particle Dynamics Study, Physical Review E, 87, 033303 (2013). 8. M S Reddy, S Muddada and B S V Patnaik, Flow past a circular cylinder with momentum injection: Optimal control cylinder design, Fluid Dynamics Research, 45, 015501 (2013). 9. K Satpathy, K Velusamy, B S V Patnaik and P Chellapandi, Numerical simulation of liquid fall induced gas entrainment and its mitigation, International Journal of Heat and Mass Transfer, 60,392-405 (2013). 10. R S Kumar, B S V Patnaik and S Vedantam, No-slip boundary condition in finite-size dissipative particle dynamics, Journal of Computational Physics, 232, 174 - 188 (2013). 11. K Muralidharan, S Muddada and B S V Patnaik, Numerical simulation of vortex induced vibrations and its control by suction and blowing, Applied Mathematical Modeling, 37, 284 - 307(2013). 12. V Anand, B S V Patnaik and B N Rao, Efficient extraction of vortex structures by coupling Proper Orthogonal Decomposition (POD) and High Dimensional Model Representation (HDMR) techniques, Numerical Heat Transfer Part B - Fundamentals, 61, 229-257 (2012). 13. R Sahu and B S V Patnaik, CFD simulation of momentum injection control past a streamlined body, International Journal of Numerical Methods for Heat & Fluid Flow, 21, 980-501 (2011). 14. K Satpathy, K Velusamy, B S V Patnaik and P Chellapandi, Numerical investigation of vortex shedding past a finite circular cylinder mounted on a flat plate, Numerical Heat Transfer Part A-APPLICATIONS, 59, 882-909 (2011). 15. S Muddada and B S V Patnaik, An assessment of turbulence models for the prediction of flow past a circular cylinder with momentum injection, Journal of Wind Engineering and Industrial Aerodynamics, 98, 575-591, (2010). 16. S Muddada and B S V Patnaik, An active flow control strategy for the suppression of vortex structures behind a circular cylinder, European Journal of Mechanics B Fluids,29, 93-104 (2010). 17. P Ashwin, B S V Patnaik and C D Wright,Fast simulation of phase-change processes in chalcogenide alloys using a Gillespie-type cellular automata approach, Journal of Applied Physics, 104, 084101, (2008). 18. S Vedantam and B S V Patnaik, Efficient numerical algorithm for the multi-phase field simulations, Physical Review E, 73, 016703 (2006). 19. C M Hwa, C L Joanne, B S V Patnaik, R Jayaganthan, Monte Carlo Simulation of grain growth in Polycrystalline materials, Applied Surface Science, 252, 1-6 (2006). 20. B S V Patnaik, Integration of comic strips, extracts from novels and poetry into classroom material, Ideas on Teaching, 3, 60-61, CDTL, Singapore (2005). 21. Y C Zhou, D C Wan, B S V Patnaik, and G W Wei, DSC solution for flow in a staggered double lid driven cavity, International Journal for Numerical Methods in Engineering,57(2), 211-234 (2003). 22. D C Wan, B S V Patnaik, and G W Wei, Discrete singular convolution-finite subdomain method for the solution of incompressible viscous flows, Journal of Computational Physics, 180, 229-255, (2002). 23. B S V Patnaik and G W Wei, Controlling Wake Turbulence, Physical Review Letters, 88(5), 054502, (2002) ( This paper was covered as a Physical Review FOCUS story by Dr John Minkel see : http://physics.aps.org/story/v9/st5). 24. D C Wan, B S V Patnaik, and G W Wei, A new benchmark quality solution for the buoyancy driven cavity by discrete singular convolution, Numerical Heat Transfer Part B Fundamentals,40(3), 199-228, (2001). 25. B S V Patnaik, K N Seetharamu, and P A A Narayana, Finite element simulation of internal flows with heat transfer using a velocity correction approach, Sdhana,26(3), 251-283, (2001). 26. B S V Patnaik, K N Seetharamu, and P A A Narayana, Finite element simulation of transient laminar flow past a circular cylinder and two cylinders in tandem: Influence of buoyancy, International Journal of Numerical Methods for Heat and Fluid Flow, 10(6), 560-580, (2000). 27. B S V Patnaik, K N Seetharamu, and P A A Narayana, Numerical simulation of laminar flow past a transversely vibrating circular cylinder, Journal of Sound and Vibration228 (3), 459-475, (1999). 28. B S V Patnaik, K N Seetharamu, and PAA Narayana, Numerical simulation of vortex shedding past a circular cylinder under the influence of buoyancy, International Journal of Heat and Mass Transfer42(18), 3495-3507, (1999). 29. Y T K Gowda , B S V P Patnaik, K N Seetharamu, and P A A Narayana, Finite element simulation of transient fluid flow and heat transfer past an inline tube bank, International Journal of Heat and Fluid Flow, 19(1), 49-55, (1998). 30. B S V P Patnaik, K N Seetharamu, and P A A Narayana, Simulation of laminar confined flow past a circular cylinder with integral wake splitter involving heat transfer, International Journal for Numerical Methods in Heat and Fluid Flow6(4), 65-81, (1996). © 2015 Department of Applied Mechanics, inc. All rights reserved.